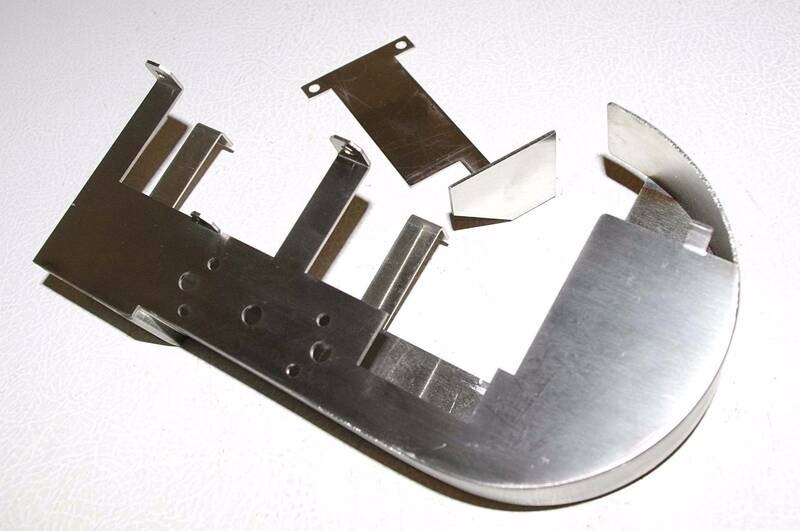 I've been working with Kerry over at Mantis Amusements for a few months now engineering a replacement scoop/weldment for Capcom Pinball Magic. 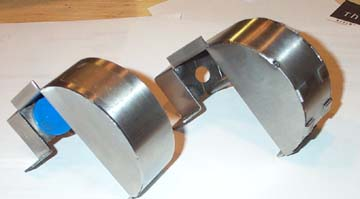 The original factory weldment suffers from the same defects as most other weldments - weak welds. 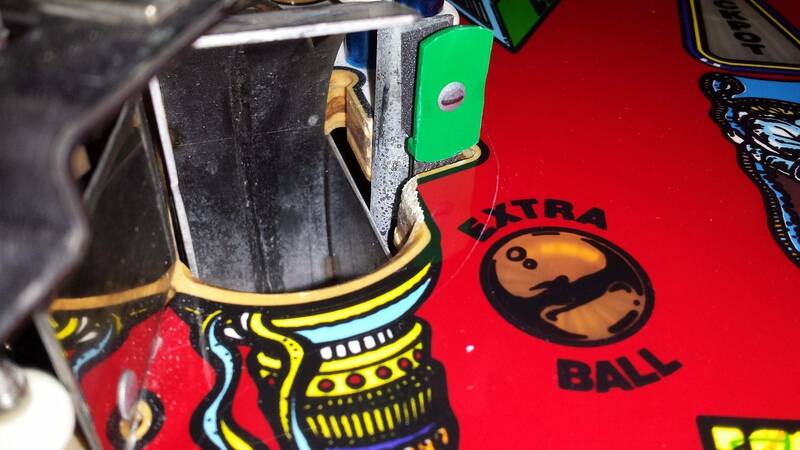 The problem with the broken welds on this particular scoop/weldment is that once the welds break, the flex in the weldment causes the playfield edge to wear at the right side of the hole. I'm attaching pics of the wear area. 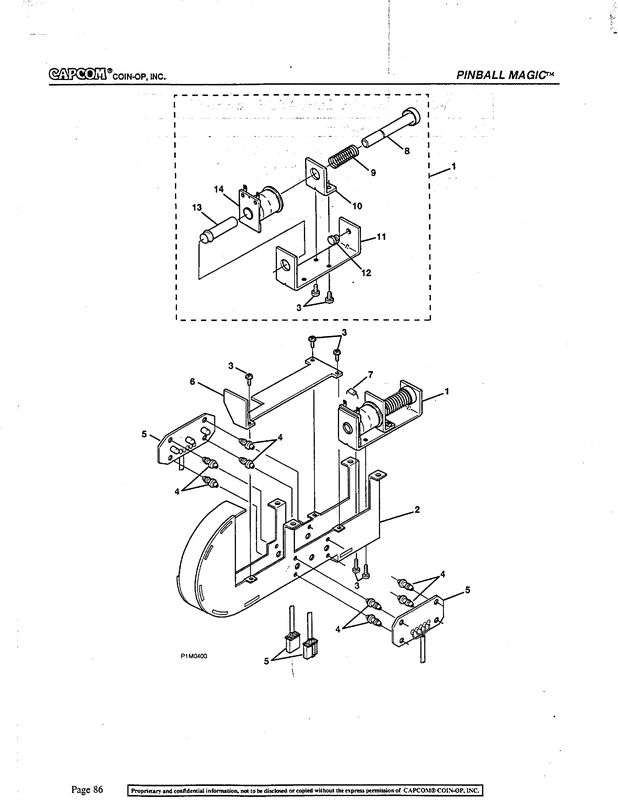 3) Bracket to support adjacent target. I haven't been given a price, but would expect these to be in-line with Kerry's other replacement weldments. Kerry has committed to making this product and the purpose of this survey is to gauge interest for his initial production run. This is great for the community! And Kerry is a great man doing this for us. I am in the middle of a tear down of my game, I will check when I get home to see how mine looks. Do you have any pricing idea? I would be interested in purchasing one as my PM is the wear in that area. Count me in. I would take one right now. Had not noticed the problem even existed until I read this post, now it is all I can think about! Pinball Magic, my favorite game of all time and hate to think she has this blemish . . . lol. 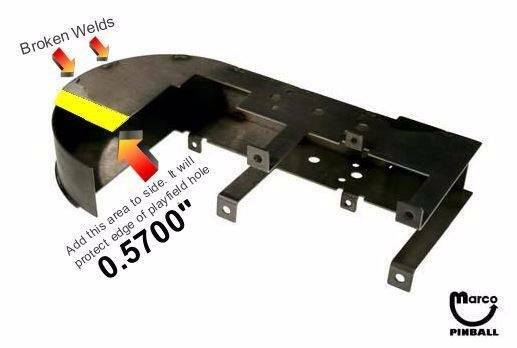 Any update on these weldments? I guess i could email mantis.. I am happy to report, now a year later, and two prototypes test-fitted, that the product is ready. I have about 50 games played with the new weldment in my PM and game play is flawless. It's nice to know that no additional wear will take place to the playfield adjacent to the weldment. Not only did we add a 1/2" higher edge to the right of the weldment as originally planned, Kerry even went so far as to add a reinforcement tab for behind the target that sits next to the weldment. 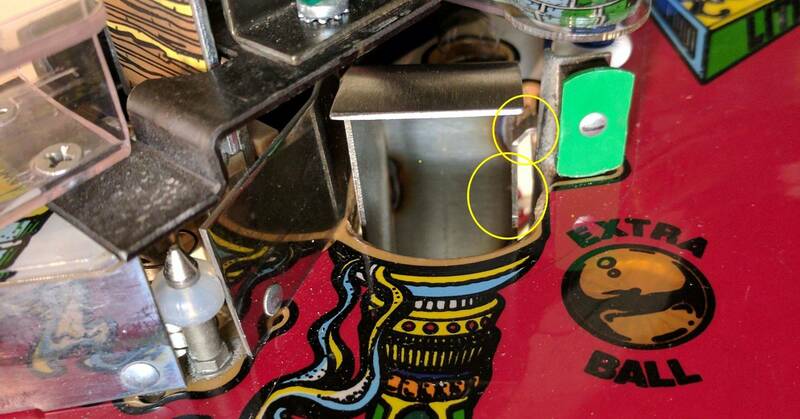 Every Pinball Magic I've seen in person (about 5 of them) has broken welds on this weldment, playfield wear next to the weldment and wear behind the green target from where the target makes contact with the playfield edge when struck. Kerry's newest product solves all those problems! If by chance your playfield isn't showing signs of wear yet, I highly suggest you are proactive in preventing it. The end result was truly worth the wait! Nice, when and where will these be available? Kerry said he only made up a handful of these and that he was waiting on some pictures before posting to his site for sale. The reason he made so few is because (1) it's a low production game to begin with, and (2) he didn't get the interest he expected with the main stage ramp weldment product for PM. Can you tell me how to get ahold of Kerry ? Sorry I bought from Kerry before. Finally, Kerry has the replacement Genie Bottle weldments available for purchase. Ordered both scoop and ramp. Mine is on it's way with a target plate and a ngg Slam ramp!